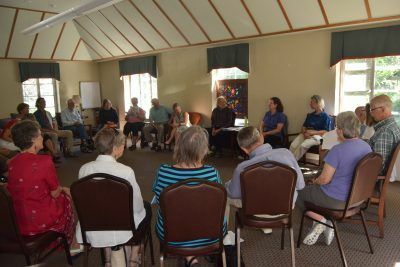 The Adult Forum meets every Sunday morning from 9:00-10:00 am September through May. The Forum is an opportunity for adults to deepen their understanding of their faith and their relationships with one another. The Forum is open to everyone, whether you come once a month, once a year, or every week. For a list of current topics, please see Upcoming Events. Discipleship Groups are small groups who meet weekly or biweekly for prayer, fellowship, and spiritual practice. Check out the Discipleship page here. Contact the Rev. Duncan Hilton (duncan@stmicahelsvermont.org) if you’d like to learn more. Education for Ministry (EfM) offers an opportunity to discover how to respond to the call to Christian service. Sessions meet weekly during the academic year. While the full program is a 4-year one, a person registers one year at a time. The first year of study is the Old Testament or Hebrew scriptures, the second is the New Testament, the third year is early church history, and the fourth year explores 20th- and 21st-century church happenings. Each class seminar focuses on some relevant issue from our culture, our personal lives, or scripture through a process called theological reflection. In the process of our meetings, we ask the “So what?” question: what difference does our faith make as we engage in the world? If you are interested in this ministry, please contact the church office (254-6048). Seasonal Studies are offered during Lent and other seasons of the year. Please check upcoming events for more information.